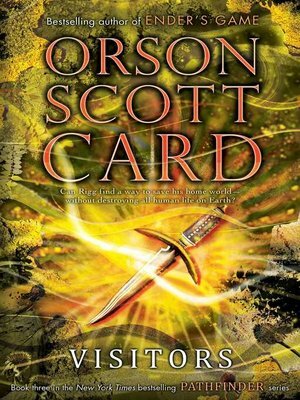 From Orson Scott Card, the internationally bestselling author of Ender's Game, comes the riveting finale to the story of Rigg, a teenager who possesses a special power that allows him to see the paths of people's pasts. In Pathfinder, Rigg joined forces with another teen with special talents on a quest to find Rigg's sister and discover the true significance of their powers. Then Rigg's story continued in Ruins as he was tasked to decipher the paths of the past before the arrival of a destructive force with deadly intentions. Now, in Visitors, Rigg's journey comes to an epic and explosive conclusion as everything that has been building up finally comes to pass, and Rigg is forced to put his powers to the ultimate test in order to save his world and end the war once and for all.